The winter issue of CNET Magazine is out and comedian T.J. Miller is on the cover and featured in an interview. I consider everybody who takes themselves seriously to be a little bit off,” Miller says. “And Silicon Valley seems to be the most effusive about how important their contributions are to society. 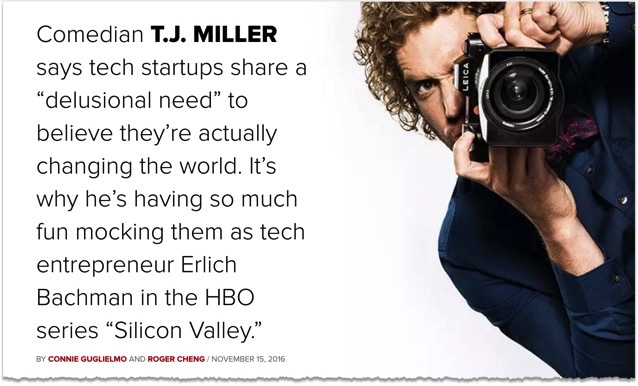 Miller proved his point last year when he hosted The Crunchies awards and upset many in the audience with his jokes about startups and the organizers said he would not be asked back. - A winter buyer’s guide with 61 excellent gift ideas, just in time for the holiday shopping season. From tiny drones that fit into the palm of a hand to chic wireless speakers fashioned from organic glasses, CNET breaks down this year’s most coveted tech products. · In “Can the Rhino Be Saved?,” CNET takes an in-depth look at how scientists, conservationists and tech companies are working to stop poachers from killing rhinos who are on the edge of extinction. · The tech industry is the source of great wealth in San Francisco, but can it help the city’s least fortunate? In “Tech and the City,” CNET examines if tech can help solve San Francisco’s homelessness problem. · CNET catches up with actor Dan Fogler, star in the Harry Potter spinoff movie, “Fantastic Beasts and Where to Find Them,” who shares his thoughts on the new film and technology’s role in creating special effects. · CNET editor Dan Ackerman provides an excerpt from his new book, “The Tetris Effect,” who explains how this simple game from the Soviet Union became a global phenomenon.